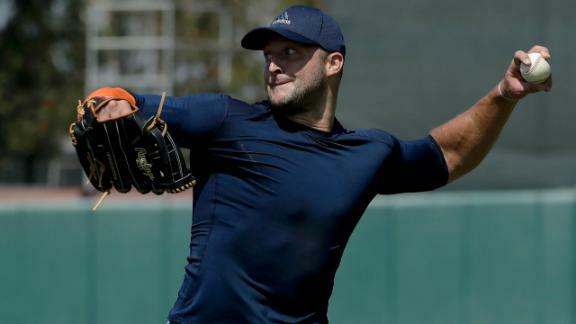 The New York Mets signed Tim Tebow to a minor league contract and said he will begin his professional baseball career in their Instructional League in Port St. Lucie, Florida. The Mets decided to sign Tebow on Wednesday, a source told ESPN's Adam Schefter. General manager Sandy Alderson met with team co-owner Jeff Wilpon, who signed off on Alderson's suggestion that they get a deal done. The Instructional League runs from September to October. Atlanta Braves general manager John Coppolella had confirmed earlier this week that the team had interest in Tebow and had "multiple" conversations with Tebow's representatives as a step toward signing him to a professional baseball contract. Tebow, 29, worked out for 46 scouts representing 28 teams last week in Los Angeles. Tebow, who hasn't played organized baseball since his junior year at Nease High School in Ponte Vedra, Florida, in 2005, has been working out with former big league catcher Chad Moeller in Scottsdale, Arizona, since Memorial Day. Tebow spent almost two hours last week at the USC's Dedeaux Field running a 60-yard dash, shagging fly balls, throwing from the outfield and taking swings against former major league pitchers David Aardsma and Chad Smith in his audition for clubs. Brodie Van Wagenen, Tebow's baseball agent at Creative Artists Agency, told reporters that several clubs stayed after the workout to meet face-to-face with Tebow. The Colorado Rockies?were reportedly another team with interest in the former quarterback. Tebow won the Heisman Trophy for the Florida Gators in 2007 and captured two national championships. ?He played professionally for the Denver Broncos and New York Jets from 2010 to 2012 and got looks from the New England Patriots and Philadelphia Eagles in 2013 and 2015, respectively, but never played in the regular season for those teams. Information from ESPN's Jerry Crasnick was used in this report.